Founded in 2012, Lake Effect strives to create fun and harmony for audiences throughout the lakeshore. The group chose their name because everyone knows it's "cooler by the lake" and believe they provide some cool music for their audiences. We hope you agree! Jim Rasmus sings Bass in the quartet. He is a retired pastor and aspiring author. Jim and his wife Martha enjoy traveling and are busy trying to keep up with their 9 granchildren who live in the area. Now that their cottage is done, Jim hopes to spend more time on the golf course this summer. If you ever hear someone singing a really odd tune a little too loudly at the Wellness Center, it's probably Don Lewellen practicing one of his Baritone parts. Don joined the quartet in January of 2015 after retiring as an eye surgeon. He lives in Manitowoc with his wife Ellen and enjoys biking on their tandem and fly fishing whenever possible. Don was named the Chordsmen's Barbershopper of the Year in 2017! Singing Tenor is Paul Blair. He has been singing in organized groups and choirs since he was in second grade and been a member of the Barbershop Harmony Society since 1991. 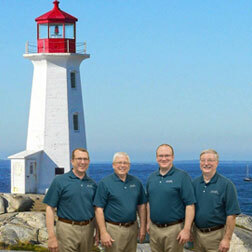 Paul recently joined the Manitowoc Chapter and also sings with the Green Bay Chapter where he has sung in several quartets and served as both Director and President. 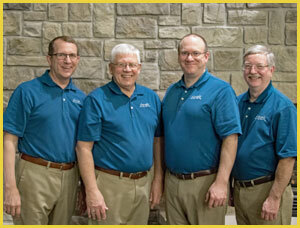 Paul is proud that his son Mike continues the barbershop tradition singing with the quartet Vocal Fury. Paul and his wife Mary live in Green Bay. Anthony Schreiter is often heard singing the melody as our Lead. Besides singing, Anthony also enjoys playing a number of different musical instruments (explains the pitch piping skills). Anthony is a Manitowoc native and lives there with his wife Julie and daughter Taya. When he isn't singing, Anthony works as an Academic Advisor for Franklin University. During his "free time" he enjoys bicycling, woodworking and learning about many different interests. One thing is certain, Anthony's unique sense of humor guarantees quartet practice is never boring. If you'd like to book Lake Effect for your event, contact Don Lewellen, 920-242-6730 or by email, theLakeEffectQuartet@gmail.com.